Recently I made a big move from the US to China for a teaching job, which is part of the reason for my extended writing hiatus. This was a major life change for me, as well as a way to experience a new culture and travel to a part of the world that is completely foreign to me. I think it is these experiences that promote the most growth within a person and I felt that I was ready for that in my life. I did find growth, but from a most unlikely place…my kitchen! When I arrived in China, I had two weeks to look for and decide on an apartment. It ended up being easier that I expected, and as someone who loathes apartment hunting, I was eager to find something quickly. As someone who loathes apartment hunting, my search in China was short and sweet. After seeing just three options, I decided on one that was close to both my job and a metro stop. The location was perfect, the price was right, and there was even a great fruit stand right outside! My only reservation…the kitchen (or lack thereof). With only a sink, hotplate and small counter, I felt downtrodden upon the first viewing. However, after some contemplation, I decided to take the apartment, tiny kitchen and all. Let me tell you how my kitchen taught me some valuable life lessons. Gratitude is a magical emotion. When anything is done from a place of gratitude, your perspective on that thing or situation changes. Suddenly whatever may have been bothering you simply does not matter any longer. You see what you have in a new light and can appreciate the gifts that you have. My kitchen may be small, but I have a roof over my head and a safe place to call my own. In fact, this is the only time in my life I’ve lived on my own and am enjoying every moment. Therefore, the fact that there is a tiny kitchen should not even register in my mind. After putting things into perspective, I was able to see the situation with new eyes and start to appreciate what I have instead of look at what I lack. How much could I possibly create with a hotplate and electric kettle? The answer might surprise you. I have whipped up meals of bok choy with mushrooms and tofu, spicy vermicelli noodles and some great salads. I may be limited in space, cooking equipment and familiar ingredients, but isn’t part of the fun in creating something about learning how to work with what you have? After all, if we all had unlimited access to whatever we wanted, how would we ever be challenged and encouraged to grow? Learning how to stay flexible and veer from the intended plan is a valuable life lesson that I have had to be reminded of over and over. Perhaps my tiny kitchen will finally be the thing that allows this lesson to really permeate into my being. Anyone who lives and breathes on this planet can attest to the fact that life does not always go according to plan. My original plan of coming to China, exploring local ingredients, creating new recipes and hosting dinner parties was quickly foiled by my tiny kitchen. However, it was me that was in the wrong by holding expectations of what my time in China would be like. Any time that you have expectations of what something will be like, you are setting yourself up for disappointment. I have been guilty of this in the past with classes or events that I’ve hosted. They certainly did not all turn out as I had imagined in my head, but they were all still wonderful in their own way. Vegan, yogi, cook, writer; these are some words that I’d come to identify myself with. Cooking is not only my hobby, it is my passion and was my livelihood for a time. If I didn’t have my kitchen to make my creations, then who was I? The answer…me! I’m still the same person I was before. These labels do not define me or give me value one way or the other. Letting go of these things that I had come to identify myself with has been very liberating and I now have the space to just ‘be’. At the end of the day, it all comes down to living life with a grateful heart. Give gratitude for what you have and you will never feel like you are lacking anything. When people find out I am vegan, they often ask me why. I don’t mind this question, in fact I welcome it. I appreciate other’s curiosity and take the opportunity to answer questions or dispel myths. However, my reasons for being vegan are vast and difficult to describe in a quick answer. So, I end up summarizing it by saying, “It’s just the only thing that makes sense to me.” Why is this? Well, here are just a few reasons why I live my life the way that I do. I’ll admit that when I began on this journey, it was for selfish reasons. I wanted to improve my health, which I did. I dropped 10 pounds (although this was not my focus), felt better, had more energy and almost never get sick. Eating animal products is at the root of many of the cases of heart disease, type 2 diabetes, cancer, obesity and so many more! The high saturated fat and cholesterol content in animal products is clogging the arteries of Americans everywhere. Also, when this meat is cooked, carcinogenic compounds form. Most Americans eat more than 1.5 times the average daily requirement of meat. We have become so conditioned to eat a diet full of animal products that we neglect the fruits and vegetables and end up eating ourselves into an early grave. By basing my diet on whole, plant sources, I can be sure that my body is getting all the nutrients it needs. Properly fueling the body is essential to living a healthy, happy life. Environmental impacts of eating meat are lesser known than the health impacts. This was one of the last topics that I learned about and once I did, it was the deciding factor for me that I wanted to change what I was doing. Animal agriculture is the leading cause of species extinction, uses half of the fresh water in the US, is responsible for 80% of amazon rainforest destruction and is a leading cause of climate change through the enormous amounts of greenhouse gasses that they emit. Land is not the only thing we are destroying, our oceans are in peril too. At the current rate we’re fishing, we will have depleted oceans by 2050. Our planet simply cannot sustain the type of life we are living and the diet that we are eating. I love spending time outdoors and to me nature is therapeutic. The thought of my young niece and nephew not being able to enjoy the same natural beauty simply is not acceptable to me, and I will fight until my last breath to spread awareness and do what I can to improve the state of our planet. If you would have told me 15 years ago that I would be an animal activist, I would never have believed you. While I’ve always loved animals and had pets growing up, I never made the connection between my pets and my food. When I began to learn the appalling factory farming practices, a shift began to happen. I did (a lot!) more research, read some books, visited an animal sanctuary and after that decided that I could no longer eat animal products. No matter what religion you choose to follow, one thing that remains constant is the concept of “do unto others as you would want done to you.” Keeping that in mind, how could you possibly participate in an industry that breeds, mutilates and slaughters living beings without giving it a second thought. These animals are looked at as mere commodities, reduced to a numbered tag or dollar amount. However, they are not commodities, they are living, sentient beings and they have a right to life just like we do. These animals have an intrinsic purpose on this earth, one of which does not include being my dinner. We’ve all heard the phrase “you are what you eat” and this is true, on both a physical and spiritual level. Biologically, your body uses the food you eat as building blocks for new cells, so on that level the food you eat literally becomes you. The spiritual impact of eating animals however can be more difficult to measure. When you consume an animal, you are consuming all that they are, both physically and emotionally. Everything on this Earth is energy, including thoughts, feelings and emotions. Eating the flesh of an animal who didn’t want to die exposes you to all the sickness, fear, stress and death that animal experienced. While I never noticed it throughout my entire omnivorous life, once I stopped eating animals, I could feel a shift begin to take place. My mind felt sharper, my intuition stronger and I had a deeper connection to myself and to a force much larger than myself. What began as a simple health decision ended up changing the course of my entire life. 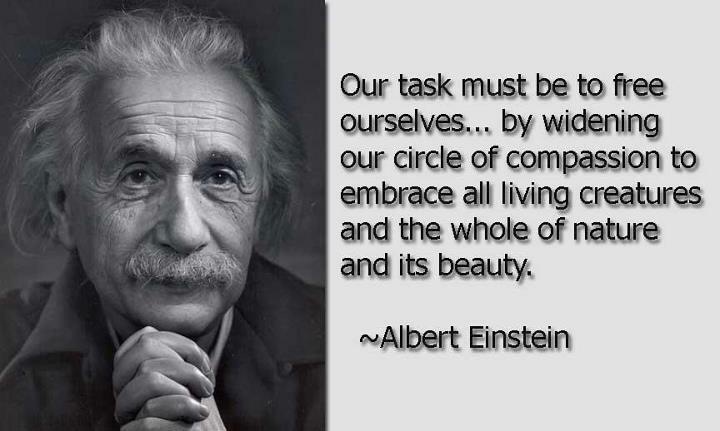 My research and experience has helped shape me into a more empathetic and compassionate person. Through my volunteer work, cooking classes and the very way I live my life, I hope to lead others to a path of compassion as well. There is a common misconception that plant based food is boring and that you are limited in your cooking. However, I find the opposite to be true. It was after I removed animal products from my cooking that I truly began to blossom creatively as a chef. How easy it is, when making a dish to just smother it in cheese and call it a day. Growing up in the Midwest, that is exactly how many dishes are made. In my opinion, that is taking the easy way out. Sure it adds flavor, but it also adds saturated fat and cholesterol, not to mention, it masks the true flavor of the other ingredients. Taking animal products out of your repertoire encourages you to explore other herbs, spices and ways of flavoring your food. Not to mention, your palette changes and you are able to better taste the different ingredients and subtle tastes in each dish. My favorite ingredient has come to be something that, years ago, I would have never tried…tofu! Tofu gets such a bad rap as a flavorless blob. Whenever I hear people say something to this effect, I am suddenly motivated to change their mind and show them how delicious tofu can be. Some of you might be thinking; “what the heck is tofu anyways?” Well, good question! 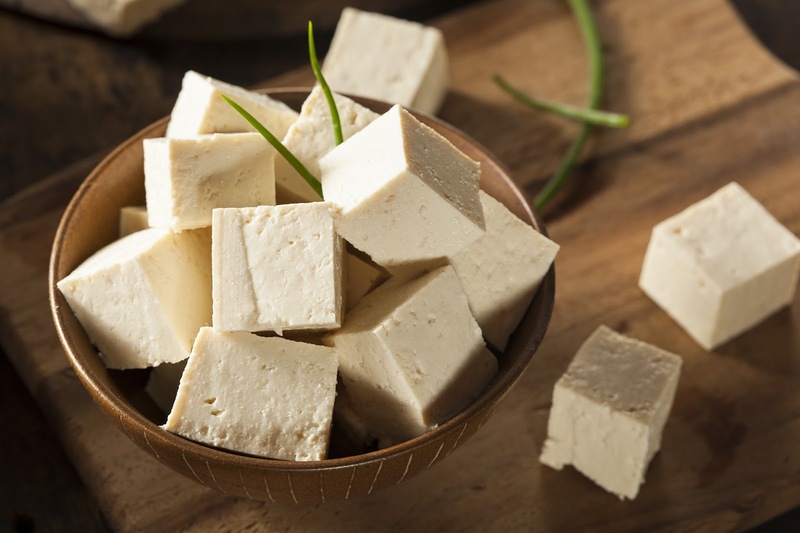 Tofu (or bean curd) is made out of soybeans by coagulating soymilk and then pressing the resulting curds into soft white blocks, similar to the process of making cheese. Tofu can be found in varying levels of firmness, depending on how much moisture is present. This is great because each type has a different and unique use. It can be used to make everything from lasagna to pie. Tofu itself does not have a flavor, which is why I think many people have a negative impression of it. Flavor certainly needs to be added, but the great thing is that it works like a sponge and takes on the flavor of whatever you add to it. If you think of it more of as an ingredient to work with, you will be able to find so many uses for it. Here are a few ways which I’ve prepared tofu. This is hands down my favorite way to eat tofu. When I am craving a hearty breakfast, tofu scrambles have become my go to. You can add any vegetables you have on hand and season it any way you’d like. The possibilities are endless! My favorite is to add some kale, drizzle in tahini and then sprinkle in nutritional yeast and turmeric to get a cheesy flavor and the color of scrambled eggs. I made this for my brother once and he said he actually forgot that it wasn’t eggs he was eating! Getting tofu to mimic crumbly feta cheese is surprisingly simple. To do this, I use the extra firm tofu, crumble it in a bowl and season. For feta, I use sea salt, lemon juice, nutritional yeast and oregano. You can make a batch ahead of time and then have it throughout the week to sprinkle on salads, soups or pastas. The consistency of tofu lends itself well to several different kinds of cheeses. Not only does it make a great crumbly feta, but you can also blend it into a creamy ricotta, which makes a great filling for lasagna or stuffed shells. By using silken tofu blended with peanut butter, cocoa powder and maple syrup, you are left with a sweet, creamy mousse. You can either eat this as is or pour it into a piecrust. There are few things more American than Superbowl Sunday. Over 100 million viewers will tune in to watch not only a football game, but an extravagant halftime show and multi million dollar commercials. Whether people are tailgating, going to a bar or gathering at a friend’s house, one thing is certain, there will be copious amounts of food and libations. In fact, this football holiday has almost become synonymous with greasy, cheesy and fried comfort foods. There seems to be a free pass on this day for people to eat whatever they please. In fact, a study done by researchers from Cornell University tracked grocery purchases and estimated that the average American will consume more than 6,000 calories by the end of the day, which even beats out Thanksgiving! Not only are they eating high calorie foods, but doing so while watching a game can lead to mindless eating, causing people to consume more than usual. Vegetables don’t typically make an appearance at the Superbowl party table, and if they do, they are probably what is left over at the end of the night. 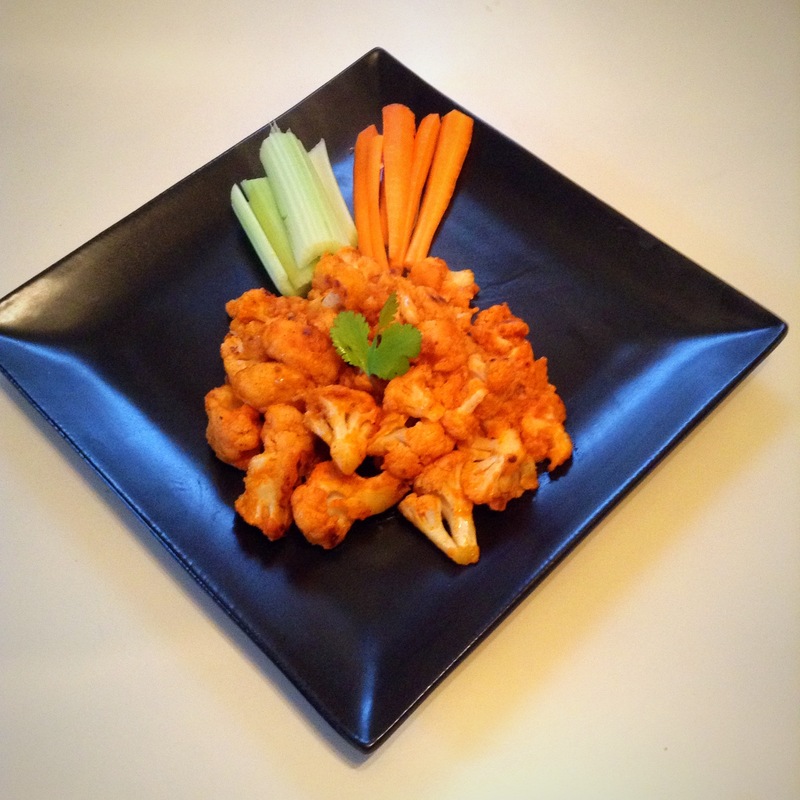 For my game day recipe, I decided to make my spin on wings and make them out of cauliflower. I made these several times before and they have always been a huge hit. The best thing about this is that it’s really a vegetable dish, disguised as comfort food. Served this with some carrots, celery and your favorite dip and you have yourself a game day hit. Need a few more recipe ideas? Try out my zesty guacamole or sweet potato quinoa bites. There is a beautiful saying that reads “cooking is love made visible.” This is something I agree with wholeheartedly. The act of cooking is not only preparing food to eat, but providing the body with nourishment made richer by the love and intention given by the preparer. In zen monasteries it was only the most advanced monks who were given the privilege of working in the kitchen. When I prepare food for others, I see this as a great responsibility and honor. This classic story from Southern India communicates the belief that the love and intention given to the food through the preparer is transferred to those who eat the food. Eating is not only a physical act, but it is spiritual alchemy as well. There once lived a husband and wife who had prayed to God all their lives to have a son. Lord Shiva finally granted them their son, but only on one condition, that he would not live past his 25th birthday. Their son grew to become a healthy, handsome, intelligent young man. When it became time for him to marry, his father went to great lengths to find a suitable bride. Finally, he found the daughter of a devoutly religious family and, feeling satisfied, made the arrangements for the wedding. At first, the young man’s mother worried that it might be cruel to marry him to a woman, knowing that she would be widowed so soon, but his father insisted that everything would work out fine. The couple married and the years passed. The dreaded birthday came and went without incident. Day after day passed, and the young man’s mother was relieved, but puzzled. How could it be? Lord Shiva himself had fixed the date. The father, seeing that his wife was concerned, suggested that she come along with him to their son’s house, and maybe they would find the answer. They arrived before dawn and stood outside a window where, in the dim light of the small kitchen, they could see their young daughter-in-law preparing breakfast for her husband. They watched as she churned the butter, and with every rotation of the churn, she chanted, “Shiva.” Throughout the rest of the preparation of the meal, the name of the god was on her lips. Finally, the meal over which she had labored for several hours was served and her husband ate it enthusiastically before going off to work. Though Lord Shiva himself decreed that their son’s life was to be limited, even Lord Shiva must heed the prayers of his devotees. Through the way that the woman prayed to the god as she cooked, her prayers went right into the food itself. As long as the man eats the food prepared prayerfully, his life will be spared. Food at a physical level is our source of nourishment for our physical bodies, however it is also filled with an unseen energy or life force called chi to the Chinese or prana in Sanskrit. Many other cultures believe in this concept as well. Through the act of preparing the food, this life force is transferred from the preparer to those that will eat the food. This is why it is important to prepare meals with a loving energy in a relaxed atmosphere. Here are some ways in which you can prepare yourself for the act of intentional cooking. So the next time you go to the kitchen to prepare food. Take a few extra moments to set a calming environment, clear your mind and think lovingly of those who will be eating the food. Taking these small steps will infuse love and life force into all that you prepare. When I first began eating a plant based diet, everyone suddenly became concerned with my protein intake. That is the one nutrient that always seemed to come up. Not B12 or iron, always protein. I’m sure many other vegans experience this because, in our society, we are taught that one needs to consume animal products in order to properly fuel their bodies and get adequate protein intake. I do not fault people for thinking this way because that used to be my belief as well. Eating animal flesh is so engrained in our culture that we think it necessary to our survival. Here are some questions to consider before you eat that egg white omelette or chicken breast to get your protein after a challenging workout. When you eat animal protein, what else are you getting? Sure, when you eat eggs, a steak or piece of chicken you are getting a great deal of complete protein. But, what else are you getting? In addition to that protein, you are taking in a good amount of cholesterol and saturated fat. Both of which I think we can all agree are not things we want in excess in our bodies. Cholesterol and saturated fat collect in the arteries causing blockages leading to symptoms such as heart attack, stroke, macular degeneration and erectile disfunction. Aside from taking in the animal flesh itself, you are also taking in everything that animal was given and exposed to. Antibiotics have been used in industrial farms since 1946 and currently account for 80% of the antibiotic use in the country. For the purpose of stimulating growth and keeping the animals alive in filthy conditions, antibiotics are regularly given to livestock. By eating animal flesh, you are also being exposed to these antibiotics which throw off the bacteria levels in your body. What effects do animal proteins have on our bodies? This topic has been studied at great lengths and we are constantly learning new information on the large role that animal products play in promoting disease within the body. Cancer specifically is promoted and fed by eating a diet rich in animal products. In one of the longest and most comprehensive studies done, the China Study, Dr. T Colin Campbell found that casein (which makes up 80% of the proteins in cow’s milk) dramatically promoted liver cancer when fed to experimental rats. Just a few years ago, the World Health Organization released a study which found that processed meats cause an increase in certain types of cancer such as prostate, colorectal and pancreatic. Could there be a danger is consuming too much protein? The Dietary Reference Intake of protein is 0.36 g per pound of body weight, of course this will vary a little depending on your activity level. When you consume more protein than your body needs, those calories get converted to sugar and then fat. These increased sugar levels can feed bacteria and even cancer cells. What are some good, plant based sources of protein? You can see a few tempeh recipes in my Tempting Tempeh post from a while back. Hippocrates, often referred to as the father of modern medicine, stated long ago that “all disease begins in the gut” and he was right. It is your gut that determines what nutrients are absorbed and what toxins are kept out. The health of your digestive system is directly linked to the health of your whole body. Read here for ways to keep your digestive system healthy. A high fiber diet keeps food moving through your digestive tract. There is soluble and insoluble fiber, both of which are important and should be included in your diet. See below for some good food sources of each. This type of fiber dissolves in water creating a gel like substance which helps slow the digestion of food. Soluble fiber helps to regulate your blood sugar and keeps you full longer. Think of this as a street sweeper going through your system and moving the waste through. Insoluble fiber is what keeps you regular and prevents constipation. Many of you are probably already familiar with probiotics now that more and more products on the market are including them. These are live microorganisms that are the same as those that are already present in our bodies. Cultivating these organisms is beneficial to our health because they help digest food and destroy disease causing bacteria. Something that you may not be as familiar with is called prebiotic, which is actually a form of dietary fiber. They are undigestible plant fibers that live inside the large intestine and act as food for the living probiotic organisms. Naturally, the more food you provide for this beneficial bacteria, the more you will have. Luckily, many foods that you probably already eat are good sources of these prebiotic fibers. This one should not come as a surprise to you. After all, water is what makes up over half of our bodies and fuels all of our bodily functions. Think of this as oil in your car, with too little, problems start to occur and with none, it will cease to function. Drink up and aim for about 2 liters a day. Take time for some physical activity at least 3-4 times a week. Performing cardiovascular exercises helps to strengthen your abdominal muscles. By getting your blood moving, you will stimulate your muscles to move digestive waste through your body. Make your exercise fun and something that you actually enjoy. This will make it much easier and more likely that you’ll incorporate it into your daily life. Be sure not to miss any posts! Enter your email address to follow this blog and receive notifications of new posts.